The Don, as he was known had a fantastic record in the marathon where one of his finest runs was that pictured above – although Hill eventually passed him to finish sixth to The Don’s seventh, it was one of the best ever races by a Scottish endurance runner. He had a super career as a runner on all surfaces and over all distances – 25 sub 2:20 marathons for a start! He continued this excellent running as a veteran and in the 45 – 49 age group he appeared four times in the world rankings with times of 2:19.1 for eleventh in the world all time list as well as 2:19:36 (16th), 2:23:00 (54th) and 2:27:27. There are two articles below: one is Colin Youngson’s previously unpublished biography written with the co-operation of Don himself and below that again is the article that I wrote for the Scottish Marathon Club magazine of April 1984 – again with Don’s help and it may be that you can see his turn of phrase scattered throughout. There is inevitably some overlap but they are very different articles. Colin first. While at George Heriot’s School in Edinburgh, Donald Macgregor was no good at rugby. So he tried running a mile on the track and, miraculously it seemed to him, won an inter-school event, breaking the five minute barrier just three years after Roger Bannister had broken the four minute one. At St Andrews University he improved in cross-country events and qualified as a teacher of French and German. By 1965, at twenty-five years old, he had: finished fifth in the Scottish National cross-country; run for Scotland in the International Championships; won the SAAA ten miles track, beating Alastair Wood; and decided to try the SAAA marathon. In preparation he ran two weeks of 100 miles each. During the race, Donald kept up with the experienced and confident Alastair Wood, who eventually drew away up a long hill about nineteen miles. Wood won in 2.20.46 (his third championship record) while Donald struggled in to finish in 2.22.24 – a painful but promising debut. By 1967, Macgregor had progressed to third in the AAA marathon (2.17.19) behind Jim Alder and Alastair Wood. This was after three weeks of ‘intense hot weather training in Vichy, France’. He ran ten to fifteen miles in about six minute miles; and, on alternate days, a speed session, such as fartlek, or two miles of short sprints and short recoveries, or 30×200, or 4×600, or four times a mile in 5.00 to 5.30 with a 200 fast non-recovery! About seventy miles per week, which led to good track speed and a personal best in the marathon. In 1969, Donald represented Great Britain for the second of many occasions, this time in the famous Kosice marathon in Slovakia, finishing second (2.17.12) to Demissie Wolde of Ethiopia, who had been seventh in the Mexico Olympic event – an omen for Munich 1972? By now, Donald was teaching at Madras College in St Andrews, and most weekends came through to run very fast with an infamous Scottish ‘training school’, based at ‘The Zoo’, a large house at 78 Morningside Drive in Edinburgh. Many of the runners had nicknames: ‘The Beast’ was Fergus Murray; ‘The Crab’, Martin Craven; ‘The Bear’, Chris Elson and so on. Most of the denizens were linked to Edinburgh University, which had an exceptional cross-country team, winning Scottish National and British University titles and breaking the Edinburgh to Glasgow record. Other International runners in the group included Dave Logue, Gareth Bryan-Jones, Alistair Blamire and Alex and Jim Wight. 1970 was the year when the Commonwealth Games were held in Edinburgh and the trial for the marathon was hotly contested. Donald Macgregor ran almost 4700 miles in training that year, the most he ever did. He was only narrowly outsprinted by Jim Alder (the 1966 C.G. gold medallist) and was delighted to make the Scottish team. In the Games event, Ron Hill of England rocketed away to a British record of 2.9.28 (still, more than 40 years later, a Scottish All-Comers best performance). Donald has written that Hill ‘ran like a god…no praise could be too high for his performance.’ Jim Alder was the bravest of silver medallists and Macgregor was satisfied to finish 8th in a personal best of 2.16.53. 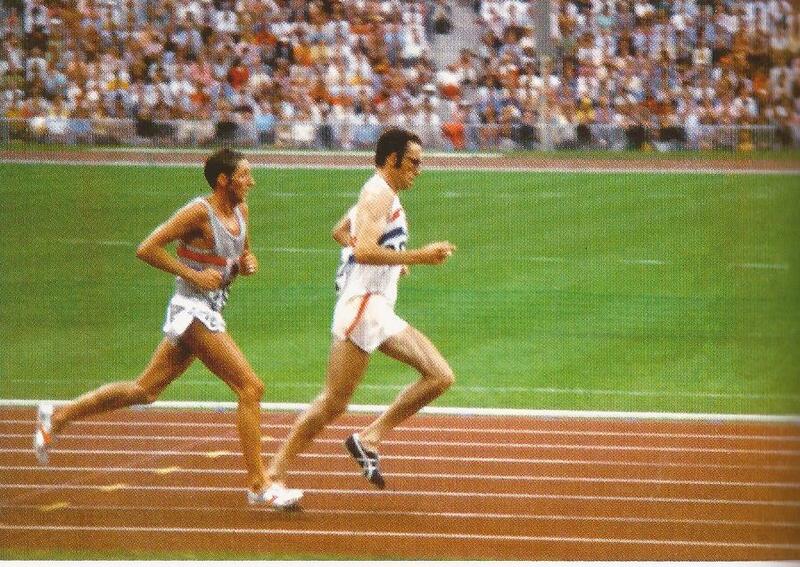 It was in the Olympic year of 1972 that Donald Macgregor, aged 33, reached his peak. In preparation for the Maxol Marathon British trial, as well as averaging ninety miles per week, he tried two consecutive 120 mile weeks, a month before the race. In addition this was his second attempt at the carbohydrate depletion/loading pre-marathon diet. In the Maxol it worked perfectly – he passed thirteen rivals during the second half, and finished in 2.15.06 to secure a surprise place in the British Team. Having recovered quickly, he managed ten 100 mile weeks, mainly at 5.30 per mile, and spent three weeks at altitude in St Moritz, coming down to sea level ten days before the Olympic marathon. In Munich on Sunday September 10th, he paced himself very well and came through fast, moving from 30th at 5k to 8th at 40k. Ron Hill wrote in ‘The Long Hard Road’ “I glance round and get the shock of my life: there, head on one side (the left), black-rimmed spectacles, grimacing face, it’s Macgregor ….He’s ungainly but Christ he’s travelling, he’s like a man possessed.” They passed Jack Foster of New Zealand; then Hill’s desperate sprint on the Olympic track left Donald to cross the line 7th in 2.16.34 – a very fine achievement, and one of which the modest Macgregor is rightly proud. In 1973, Donald picked up his first SAAA marathon title from Jim Wight and both were selected for the Christchurch Commonwealth Games. Before the Scottish championship, Donald had been living and training around Dunoon. After three months of races over distances from 5k to 16 miles, he “did ‘the diet’ between Sunday lunchtime – (I lost 4.5 lbs on the morning 14 miler) – and Tuesday p.m. (14/3; 7/3; 7/3); and then ran next to nothing on the carbo-loading phase (3/3; 4;2.” Amongst his Scottish rivals, Donald was infamous for always getting the pre-marathon diet right and finishing very strongly indeed. Before the Commonwealth Marathon, Macgregor maintained well over ninety miles a week for sixteen weeks and was fit, but perhaps not fast enough due to a lack of races during the last six weeks. His room-mate Ian Stewart convinced him to go for a slow run immediately after arrival at Christchurch airport, in a successful attempt to deal with jet-lag. Race day was on 31st of January 1974. Despite finding the pace too rapid after five miles (Ian Thompson beat Ron Hill’s Championship record with 2.9.12), Donald passed several runners in the second half of the marathon to end up 6th in his best-ever time of 2.14.15. Donald won the SAAA marathon titles in 1974 and 1976, and continued to win medals in the event until his ninth in 1986, twenty-one years after his debut. As a new veteran in Hanover in 1979, Donald ran an impressive30.04 to win the World Veterans 10,000 metres by 55 seconds. Then in the marathon, after he had waited for John Robinson of New Zealand, and had agreed to run in together, his companion sprinted away for a one-second win. However in August 1980 near Bellahouston, Glasgow, a determined Macgregor overtook Robinson with three miles to go and gained revenge by winning gold (2.19.23) in the World Veterans Marathon Championship, just 70 yards in front. In 1983 he seemed reborn at 43 when he won the first Dundee People’s Marathon in 2.17.24. Donald Macgregor has run the most sub-two-twenty marathons by a Scot – 24. Durable Donald won the Scottish Veterans M50 cross-country title despite problems with fading eyesight, steamed-up spectacles and a tendency to trip over dips, ruts and obstacles. He went on to win races in the over-Over 70 category. In retirement from teaching, this droll, self deprecating man serves on the Community Council in St Andrews and talks as he writes with forthright enthusiasm. .
Now my own story – possibly not as up close as Colin’s but one with which I was quite pleased. It covers the time from his school days and he even mentions particular people who were influential in getting him started and shaping his career from school days right through to his running sub-2:20 as a veteran. It is maybe an appendix to Colin’s article which qualifies and adds to some of the points raised. Don McGregor is unique. As a marathon runner, he has won three SAAA titles and is universally respected abroad as well as at home; he has proved extremely efficient as an administrator and been elected President of the SCCU; as an adviser of top marathon men he has been asked for advice by many of Scotland’s top men; he has done sterling work at grass roots level for his own club, Fife AC, and on behalf of the Dundee People’s Marathon. A former SAAA marathon champion has said that although Jim Alder, Dunky Wright and Joe McGhee have better records in terms of Games successes, Donald’s overall contribution to the sport in Scotland exceeds a lot of these people. Having indicated the width of his contribution to distance running north of the border I would like to take a look at his career as a runner in some detail. It can be seen from the figures above as well as the results against Wood that he was in good form for the marathon. Perhaps unfortunately for the new boy, the race was held over what he recalls as an undulating sort of course – it was in fact the very hilly, dead straight and fairly tough course from Anniesland along the Great Western Road to Dumbarton and back again and the opposition including the aforementioned Wood whom many of the top men have described as ‘an obviously very hard man’, ‘tough in competition’ and so on. Donald held on until just after the 20 mile mark and despite wanting to drop out at about 23 miles carried on to the finish. By now, ‘The Don’ was racing a lot and racing well. In 1969 he ran in the star studded Maxol Marathon in Manchester (not too well) and then finished second in the international race at Kosice in the same year. He is quoted in ‘Athletics Weekly’ in December 1969 as saying that his target was a medal in the Commonwealth Games in 1970. This didn’t happen and it is common knowledge what sort of a race that turned out to be. His next target had to be a place in the Olympic Games team in 1972. He continued to run well and, to quote Ron Hill, ‘a surprise third in the race overall was Scotland’s Don MacGregor in 2:15:06. (Ron Hill had been second.) The reigning Scottish champion was Alastair Wood and jogging together before the race he had asked Donald what time he was looking for and was told two hours fifteen minutes! He more than justified the faith of his club who had helped him with his air fare to the trial. Moving from 20th at eleven miles to third in a time almost two minutes faster than his best he had won his ticket on the plane to Munich. The Munich race is well documented in Ron Hill’s book if nowhere else but for one top Scots runner one of the sights of the Olympics that year was Ron Hill’s face as he realised that another British runner was catching him.. Donald ran a first class race to be seventh to Hill’s sixth. Hill’s comment about him was not very original – verging on cliche for most Scots runners in fact – but sums up The Don in action: “He’s ungainly, but Christ he’s moving.” There were only four seconds between them at the end. Donald himself admits to feeling pity for Ron when he caught him up because he had put so much into winning this race. He suggests too that perhaps Ron was the unwitting architect of his own downfall: by staying at altitude until 7 days before the race he did not give his body time to adjust to the new conditions. For Don himself the relative success of the Olympics gave him a tremendous lift and a new stature as an athlete that he had not had before despite his excellent running at all levels on all surfaces (except Ostend mud!) He put an end to his lack of SAAA Marathon titles by winning in 1973 (2:17:50), 1974 (2:18:08) and 1976 (2:24:12). He tried ultra distance running with some success and still holds the Scottish records for 25000, 30000, 35000 metres and for the two hours run as well as 20 miles (1:42:07). he also had a go at the Two Bridges race in August 1974 where he finished seventh (first veteran was in third place and was called Alastair Wood). He kept on running marathons, road races, relays and cross country for club and country – in 1974 he was third Briton in the ranking lists with 2:14:15; in 1975 he slipped to 2:20:50 for 28th in the GB lists; in 1977 he was running 2:18:31. In his first year as a veteran he won the World Vet’s Marathon Championship in Glasgow and last year at the age of 44 he won the Dundee Marathon in 2:17:24. Brief as it is the above gives only the bones of his marathon running career and barely hints at his achievements in other events. What is he like as a man? My correspondents all agree on one thing: The Don’s sense of humour. Maybe training for the event nowadays makes a sense of humour more desirable or necessary than before. In any case, his is described more as subtle satire. I am reliably informed that he used to do a wonderful impersonation of the archetypal SAAA official; on another occasion having won a trophy for his run in the Westland marathon he spent the boat trip home unscrewing the trophy and re-assembling it in various ways, each more ridiculous than the last. In the course of an SAAA marathon when Robin Morris appeared for the umpteenth time in a few miles shouting fiercely he turned to the other races to comment: “I hope he doesn’t intend keeping that up for 26 miles!” He has been described as an excellent committee member being articulate, well organised and intelligent, and even better team manager being as one might expect athlete centred instead of being an official official. Endurance which he feels is best achieved by lots of slowish, medium and even fastish runs. Speed which involves lots of shorter races on all surfaces but not too often. Experience which takes time to acquire. By this he doesn’t mean necessarily marathon running experience but more racing in general over shorter distances. Rest. Another runner once told me that knowledge of when not to run was as important as knowing when to run. Donald feels that it is important to ease right back in the week or two prior to the race although this should be seen in the context of a 10 or 15 week build up. His basic advice seems to be don’t train too hard unless you feel like it and there is no need for ‘bashing’ in training so long as you have a short race every 2 – 3 weeks. The maximum would be three or four marathons per year to give the runner adequate time to recover psychologically. Finally, on the question of diet. Donald, according to one SAAA champion kept charging through late in races because of the effects of the diet. It was a surprise to many when he gave it up completely. The man himself says that there is no need to attempt it until you can run under 2:20 without it. It did help him in three bug races including Munich but he doesn’t do it often since the Commonwealth Games in Christchurch since he can’t stand the strain of the first three days. His advice is not to deprive yourself totally of carbohydrate in the first three days – Ron Hill ate the occasional yoghurt as well as apple and orange during the low carbohydrate phase. If George Sheehan can be described by ‘Runners World’ as a renaissance man because he can write and run as well as be a doctor, then I suppose Donald should really be called Leonardo. As I said at the start – Donald is unique. Donald was a hero to many of us for a long time. Unlike many he is always free with his advice and has written several articles and reported on races for magazines and newspapers and even broadcast training advice over local radio in the run-up to the Dundee Marathons. The photograph below was taken at a reunion dinner in April 2012 and Donald is seen here with Lachie Stewart and Fergus Murray. It was a good evening and Donald enjoyed watching the slide show and talking with all his old cronies.